Hostal Jero is back with a fresh style and image that includes our new name “Jero Rooms”. Modern and international, we renew ourselves while we offer you a website where you can access all our services. Following a few simple steps, booking a reservation for any date and at the best price will now be much easier. You can view our rooms and see the best pictures of the surroundings so you don’t miss out on the wide range of things our hostel and the city of Valencia have to offer. All the city centre’s most important monuments and the best restaurant areas are just one step away. If there is something we pride ourselves on it’s our situation, a space with which we share a great family history for generations, where we offer affordable accommodation but definitely of high quality and in the best location possible to do tourism in our city. Jero Rooms is a family chronicle, a story with an extensive trajectory that brought us from a small dairy business to what we are today, a budget hostel that offers a pleasant and comfortable stay to visit Valencia. A city with so much to offer that you will love it, just like we do for generations. 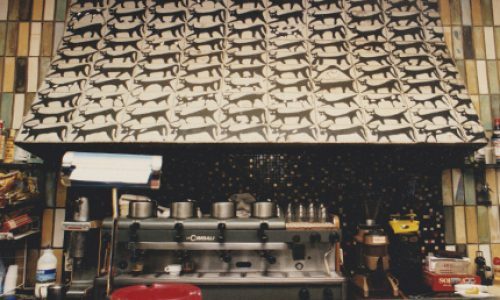 Everything began around 1966 with the purchase of a small dairy business by Jero’s grandfather in the same place that today occupies the reception desk of our hostel. After years of work this became a cafeteria, and we managed to consolidate ourselves as a place for meeting up, of closeness and quality in the catering sector of the area. Through the effort and daily work paying off, he began purchasing one by one the apartments of the building until he owned the entire property, opening the hostel and moving his family to the top floor, where he formed his home. Therefrom, the second generation of this family -his three children- began working in the cafeteria at a young age while still in school, and later on, two of them decided to work exclusively in the family hostel business. Another generation wanting to give their best in customer service and hotel sector work.